"HUL" redirects here. For other uses, see Hul (disambiguation). The Harvard Library system comprises about 73 libraries, with more than 18 million volumes. It is the oldest library system in the United States and the largest university library and largest private library system in the world. Based on number of items held (including musical scores, maps, prints, recordings, etc. 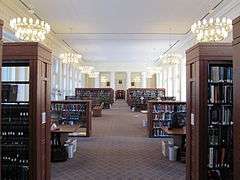 ), it is the fifth largest library in the United States; based only on volumes (generally books), it is the third largest, after the Library of Congress and Boston Public Library. Access Services connects the academic community to the vast array of library resources. Information and Technical Services is responsible for acquiring, licensing and providing access to tangible and online collections in all formats. Preservation, Conservation and Digital Imaging Services is committed to ensuring that library materials remain secure and usable for contemporary and future scholars by conserving materials, digitizing collections, preserving library content in digital formats and providing robust education and outreach programs. The Harvard University Archives is the institutional archives of the University. It oversees the University's permanent records, collects Harvard-related manuscripts, papers, and historical materials, and supervises records management across the University. Finance supports the Library by providing accurate information that assists decision-making, maintaining the integrity of finance systems and completing financial transactions. Program Management ensures that potential projects and approved projects are managed in a considered, predictable and transparent way. The Office for Scholarly Communication provides for open access to works of scholarship produced by the Harvard community. 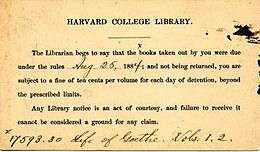 Harvard's library system grew from a bequest in 1638 by John Harvard of 400 books. The location of the library changed over time. Originally it was in the Old College building. In 1676, the library was moved to Harvard Hall, which was where it remained until the building burnt down during the fire in 1764. A new Harvard Hall was built. As time went on space became limited in Harvard Hall, and the library was moved to Gore Hall in 1841. Eventually, Gore Hall was no longer suitable and the books were moved elsewhere in 1912. Around this time, the library spread into more than one building. Some of the libraries were devoted to specialized topics. Over the next century the library grew to become the largest in America, but on January 24, 1764 a major fire destroyed almost all of Harvard's books and scientific instruments. All of the books in the library at the time of the fire were completely burned. The books that had been loaned out when the fire occurred were the only portion of the collection that remained. Books and donations were offered by friends of the college to replace its collections. An eccentric Englishman, Thomas Hollis V of Lincoln's Inn, London, (great-nephew of one of the University's early benefactors), began shipping thousands of specially chosen volumes to the University Library. Hollis continued to send books regularly until his death in 1774 and he also bequeathed £500 for a fund to continue buying books. This became Harvard's first endowed book fund, and is still actively increasing the collections every year. 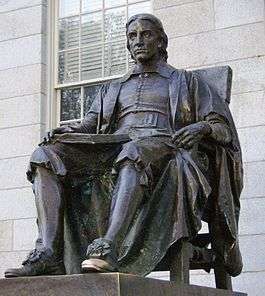 Harvard Library's online catalog, HOLLIS (a bacronym for "Harvard On-Line Library Information System"), is named after him. Some of the books have been digitized within the Google Books Library Project. which was begun as a project developed with leadership and oversight by former Director Sidney Verba. Overdue notice, 1884. "The Librarian begs to say ..."
Catalog card. C denotes Church History and Theology. 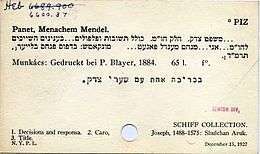 Catalog card. Swi denotes Swiss History & Literature. 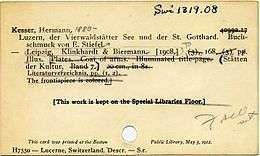 Catalog card. Scan denotes Scandinavian History & Literature. Visiting Committee members are experts and Harvard alumni who are appointed by the Corporation. The Committee oversees the strategy and administration of the Harvard Library on behalf of the Overseers. Bi-annual visits and regular updates by the Office of the Provost provide an opportunity for Visiting Committee members to understand and advise on the Harvard Library’s progress. The Library Board is charged with reviewing the strategic plans of the Harvard Library and assessing its progress in meeting those plans, reviewing system-wide policies and standards and overseeing the progress of the central services. The provost chairs the Library Board (established in December 2010) and the Office of the Provost is responsible for overseeing the Harvard Library. The Harvard Library Board is composed of six permanent members and five rotating members who serve three years each, with their initial terms staggered. The permanent members are the provost, the Carl H. Pforzheimer University Professor and the deans or designees from the following Schools: the Faculty of Arts and Sciences, Harvard Business School, Harvard Law School and Harvard Medical School. The rotating members consist of three at-large, tenured faculty members, as well as deans or designees from the Harvard Kennedy School, Harvard Graduate School of Design, Harvard Divinity School, Harvard Graduate School of Education, Harvard School of Public Health, Harvard School of Engineering and Applied Sciences and Radcliffe Institute. The establishment of the Harvard Library Faculty Advisory Council in 2011 brought together faculty from across the University. The Council advises the Library Board and the two groups meet together twice a year. Robert Darnton, Pforzheimer Professor, is the chair and James Engell, Gurney Professor of English Literature, is the vice-chair. Established in 2012, the Library Council on Student Experience is a joint council consisting of librarians and students from across the University who identify and work together on University-wide priorities identified by the Council for improving the student library experience. The Council is co-chaired by a librarian appointed by the vice president for the Harvard Library and by a student elected from the student council members. Students and librarians are nominated by the School library directors and selected by the Office of the Provost. Other members include representatives from the Tell Us project, the Berkman Institute and Harvard Library Shared Services. Terms are for two academic years. The Council makes recommendations to and is supported by the vice president for the Harvard Library. The Harvard Library Leadership Team is responsible for planning, prioritizing and implementing joint Library initiatives. The team works with the vice president for the Harvard Library to develop and implement Library-wide strategy and policy approved by the Board. In collaboration with the Library IT Steering Committee it prioritizes new technology initiatives. In collaboration with the Innovation Working Group it prioritizes innovations to be scaled. Chaired by the vice president for the Harvard Library, the Team includes library directors from the ten schools and the Radcliffe Institute, the Affinity Group heads, the managing director of Library Technology Services (HUIT), the Office of Scholarly Communications, the Harvard Library shared services heads, the HL chief financial officer, the Harvard Library director of communications and the Harvard Library senior program manager. This list covers the Harvard College libraries, the Faculty of Arts and Science libraries, and the libraries of other Harvard faculties. In addition, Harvard University has a large number of special libraries, house libraries and affiliated libraries. ↑ Harvard Library (Feb 14, 2011). "About the Harvard Library". Harvard Library. Harvard University. Retrieved January 16, 2013. 1 2 Harvard University (2013). "Harvard Library Annual Report FY 2013". Harvard Library. Retrieved 17 March 2015. ↑ Office of Institutional Research (2010). "Harvard University Fact Book" (pdf). Harvard University. p. 21. Retrieved July 29, 2011. ↑ Ireland, Corydon (November 12, 2013). "A Colonial goldmine". The Harvard Gazette. Retrieved 2013-11-13. ↑ Pezzi, Bryan (2000). Massachusetts. Weigl Publishers. p. 15. ISBN 1-930954-35-2. ↑ Karl, Thomas (1998). Toward an Earth Science Enterprise Federation: Results from a Workshop. National Academies Press. p. 27. ISBN 0-309-06134-2. ↑ American Library Association, "ALA Library Fact Sheet 22 – The Nation's Largest Libraries: A Listing by Volumes Held". October 2012. ↑ Burke, Sarah K. "Bookish fires: the legacy of fire in the Harvard libraries" (PDF). Harvard Library. Retrieved 26 October 2014. "History of the Library." In The Library of Harvard University: Descriptive and Historical Notes, 4th ed., 12-35. Cambridge: Harvard University Press, 1934. Carpenter, Kenneth E. The First 350 Years of the Harvard University Library: Description of an Exhibition. Cambridge: Harvard University Press, 1986. Bond, W. H. and Hugh Amory, eds. The Printed Catalogues of the Harvard College Library, 1723-1790. Boston: The Colonial Society of Massachusetts, 1996. Kraus, J. W. (1961). The Harvard Undergraduate Library of 1773. College & Research Libraries, 22(4), 247-252. Olsen, M., & Harvey, L. G. (1993). Reading in revolutionary times: book borrowing from the Harvard College Library, 1773-1782. Harvard Library Bulletin, 4, 57-72. Wikimedia Commons has media related to Harvard University Library. Journal of Library History, vol. 22, no. 3 (Summer 1987): 338-341.